Michael Eade. Gilded Chestnut 金栗树, Egg Tempera, raised 22k gold leaf, raised copper and aluminum leaf on canvas, 12 x 16 in. (30.4 x 40.6 cm), 2016. Michael Eade. 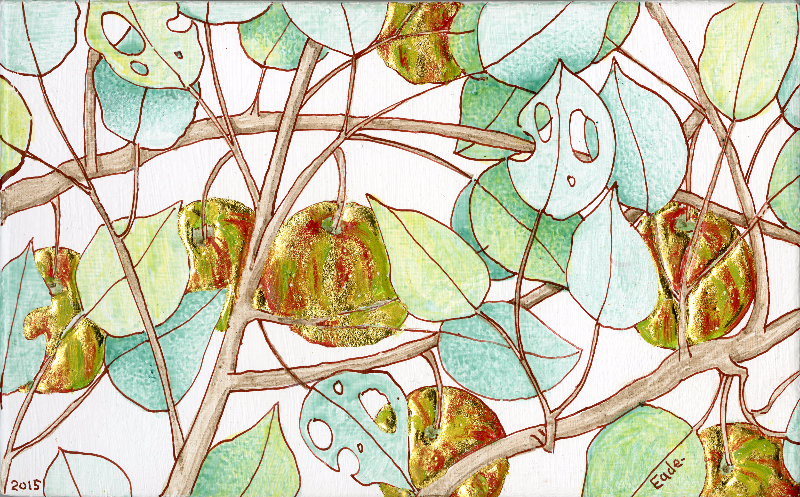 Vanitas, Wild Apple and Pear Branches 维尼塔斯，野苹果和梨枝，Egg tempera on canva, 20.3 x 70 in. (51.6 x 177.8 cm), 2011. Received a BA from Oregon State University and did further studies at the Staatlichen Akademie der Bildenen Kunste, Stuttgart (studying egg tempera painting techniques), and New York University’s Tisch School of the Arts (studying film and computer animation techniques). He has received many honors including a current residency at the Hermitage Artists’ Retreat, a studio membership at the Elizabeth Foundation for the Arts, and fellowships from the Robert Blackburn Printmaking Workshop, the National Academy Museum and School of the Fine Arts, Artists’ Fellowship Inc., and Aljira. Eade’s work appears in public and corporate collections including the Harvard Business School, HERMÈS, AT&T, the Library of Congress Permanent Collection and many private collections. In 2017, Michael Eade has his solo exhibition Realms o of the Soil at Fou Gallery, New York. Eade will have an exhibition at Pombal Palace in Lisbon in 2018. In 2010, Eade began a body of work depicting his vision of the ancient fruit forests in the western Tian Shan mountains, at the border of Kyrgyzstan, Kazakhstan and China. This area is the genetic origin to over 300 wild fruit and nut species on our planet. However, 90 percent of those fruit and nut forests have been destroyed in the past 50 years. Learning all this inspired Eade to visually eulogize this botanical Eden, into which he also incorporates in his iconic series “The Wild Fruit Forest - Tree of Life”. The series also becomes a practice to combine Eastern and Western landscape traditions for Eade: “Evolving together, filtered through my painting process and heavily referencing each other these paintings sustain a dialogue amongst themselves while providing different vistas of the remarkable Central Asian wild.” In 2016, Eade started a new series - “Nurse Log,” in depiction of fallen trees which, as they decay, provide ecological facilitation to seedling. As Eade suggests: “For me, the nurse log symbolizes renewal and rebirth, and I sometimes gild the nurse log to highlight it’s metaphorical importance in our world’s ecological system."